JoAnne’s passion for pets goes back as far as she can remember. She’s always known she wanted to work in a profession where she could help animals who may not otherwise get the help they need. That desire lead her to begin an education in Pre-Vet studies before deciding that being a Veterinary Technician was actually the right path for her. Her childhood cat, Nala, was a major contributor in helping JoAnne find her calling. Nala had three legs and JoAnne felt she never let that slow her down. It was inspiring watching her run and play just like any four-legged cat would and helped her realize that our pets are there for us whenever we need them. This made JoAnne want to be there for all pets when they need someone as well! 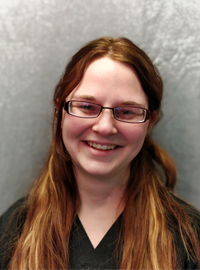 JoAnne is a graduate of Argosy University and came to Golden Valley and Greenbrier Animal Hospitals just after finishing her internship in the winter of 2018. She loves knowing she is making a difference in the lives of pets and their people and finds great satisfaction helping to support them through the good as well as the bad times in their lives. JoAnne spent most of her childhood growing up in Rochester, MN with her family and animals of all kinds. She and her husband, Josh, currently share their home with two cats, Anastasia (KitCat) and Captain Nemo, two dogs, Jen and Ichabod and albino Cornsnake, Skittles. Ichabod is the youngest of the crew and works on building friendships with the cats daily. The cats are still not sold on that idea! Besides learning about all things animal, JoAnne likes reading, hunting, fishing, swimming, horseback riding and anything outdoors. She also loves just relaxing with her family and trying to keep some semblance of order in her home!